There are no tomatoes in this vinegar-based sauce, but plenty of flavor for your pulled or chopped pork BBQ. You can also splash Wells Hog Heaven Barbecue Sauce on collards, green beans, hushpuppies or french fries for added zip, or use it as a marinade for chicken or meat. 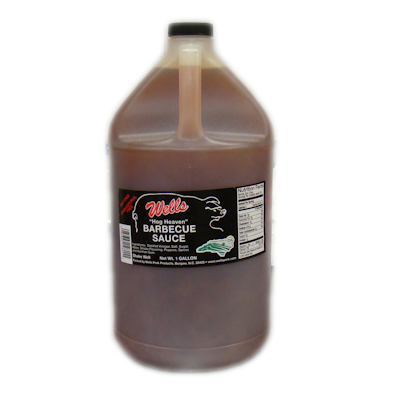 If you've always wanted to try a genuine Eastern NC vinegar barbecue sauce, Wells Hog Heaven BBQ Sauce is an excellent choice. A Goodness Grows in NC product. (1 Gallon). Click here for great grilled chicken recipes.